The bathroom fixtures are installed by the plumbers fairly quickly The faucets for the bathroom sinks, bathtubs and showers are installed in only a few hours. Faucets nowadays come in different designs, shapes and sizes. Choose a faucet, which combines aesthetic appeal, and functionality that also adds character to your kitchen or to your bathroom. Choosing a faucet that you love and that is cost-effective is not easy to do. You do not need a very expensive fixture such as a faucet just to add an innovative design in your home. Faucets come in various designs and models so you should be able to find a faucet that is functional as well as affordable. A faucet is the most frequently used fixture of a sink. The constant use can make a faucet malfunction, causing the continuous dripping of water. This is one of the main reasons why a faucet has to be durable first and yet aesthetically pleasing to the eye. Different faucet styles have different hole patterns. The three hole kitchen faucet is the traditional choice in which there is a separate handle for cold and hot water. The next faucet is the one handle faucet that integrates the handle and the spout in one fixture. If the faucet you are looking for is a replacement for a damaged faucet you already have, check first as to how many holes the previous faucet had. 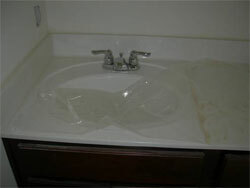 Check the sink; it will give you a concrete idea as to whether a three hole or a one-hole faucet is appropriate. You do not want two uncovered holes in your sink if you choose to replace a three hole faucet with a one hole faucet. It is unsightly to see uncovered holes in your sink and besides an uncovered hole is prone to the accumulation of dirt. You will have an easier transition in converting a one hole faucet into a three hole one. An advantage of a three hole faucet is that the water temperature can be controlled easily, however a small space sink needs to maximize its space, thus a one hole faucet can be the best option. Other considerations you need to take into account before buying a kitchen faucet is the style and finish of your faucet. Your faucet has to blend in with the overall effect of the room. If the other fixtures of the room are made of brass, choose a faucet that is made of the same material to avoid the clashing of materials and designs. The height of the bowl as well as the purpose of the faucet has to be considered before you purchase since the height of the faucet is important if you will be using large bowls and pans frequently in cooking. Water conservation is important too. Check the faucet you plan on buying to see how much volume of water it will use in a minute. Determine whether the faucet you will purchase can be used with an integrated filtration system. Some faucet models have integrated filtration systems built in. Purchase a faucet with a good filtration system if the faucet is used for drinking consumption. Mechanical consideration should also be determined before buying a faucet. Compression valve, washer less and ball valves are the compression models that you can choose for your faucet. Choose a faucet that is based primarily on the valves used. Some valves are easy to maintain and are affordable. Some valves are harder to maintain and are expensive too. Choose a faucet that is not prone to rust and has an easy to maintain the finish with simple cleaning. Choose a finish that will help create an overall look of the area. Choosing a faucet is important. Visiting local building supply stores and local plumbing supply stores will help make the decision easier. Usually these stores have many types of faucets on display. Once you see the faucets, you will be able to make a better decision on what faucet works with your sink, what style suits you best, and what faucet fits within your budget.